Once the Spanish capital of Central America for 200 years until mostly destroyed by a giant earthquake in 1773, Antigua has been beautifully restored and today is thriving and full of energy. For foodies, coffee aficionados, and architectural buffs, this is a place to see for yourself! Let’s visit Antigua! There’s really so much to do, this place could keep you busy for days. Here’s a list of our must-see’s when visiting Antigua. Antigua is small and extremely walkable, spread mostly over the area of just 10 square blocks. For such a small footprint, it seems impossible that Antigua could be the home to 35 churches! Many of these relics date back to the 1700’s and are striking examples of Spanish colonial architecture. So have a stoll and get a feel for the city’s incredible history. The main cathedral of Antigua, you cannot miss this striking church that fills the entire east side of Antigua’s main square, Plaza Mayor. Inside this bustling church, look for the gilded floats featuring Catholic saints that are used during many of the city’s parades and festivals. Partially restored in 1967, the San Francisco el Grande holds the tomb of Peter of Saint Joseph Betancur, a Guatemalan missionary who was canonized in 2002. Iglesia de San Francisco is also home to the ruins of a 17th-century monestary that you can explore for a small fee. Don’t miss a visit to the sprawling Convento Santa Clara ruins in the center of Antigua. For a small fee, explore the hallways, courtyards, and chapels of the 18th-century convent that is slowly being restored. Look for the small plaques that are dated with the different phases of restoration. Like many Latin cities, you can expect plenty of Catholic-derived festivals in Antigua. Most notable is Holy Week, when the jammed city streets are decorated with intricate designs of flowers and colored sands, and host neverending processions of gilded saints with mortars exploding overhead. But no worries if you can’t visit Antigua over Easter, the city’s 35 churches keep nearly every weekend busy with patron saint fiestas throughout the year. Strangest festival? La Quema del Diablo or “Burning of the Devil” takes place on December 7 at 6pm sharp. In order to rid their homes of evil spirits, locals burn personal items each year on this date along with an effigy of the Devil. As home to some of the world’s best coffees, there’s no wonder Antigua seems to be bursting with cafes serving up Guatemala’s finest and it seems you really can’t go wrong for coffee here. There are also some pretty great eating and drinking establishments in this charming town. For Eats: Fridas – the cool and funky Frida Kahlo-themed restaurant, serves up simple yet modern Mexican food to the beat of energetic pop music. For Drinks: Cafe No Se – this hip candle-lit tavern is the birthplace of Ilegal Mezcal and is the first mezcal bar outside of Mexico. Make your way through the tiny inner door an find the secret mezcal bar within. With an elevation of over 5000 feet this mountain-top lake surrounded by volcanos and Mayan village is a site to behold. We highly recommend including at least a few says to Lake Atitlan to any Antigua, Guatemala trip. 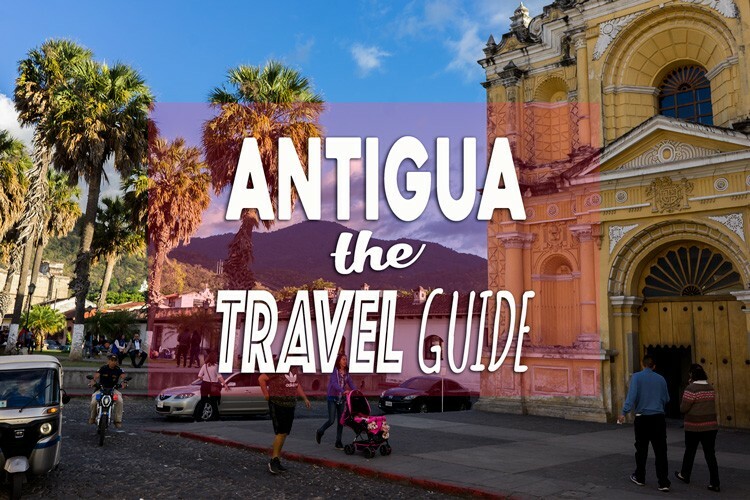 Antigua’s nearest major airport is Guatemala City’s La Aurora International Airport, about 1.5 hours away. If planned in advance, you can find reasonable direct flights to Guatemala City from most major hubs in North America including Houston from $217, Mexico City for $176, or Miami for $240 with our favorite flight search site, Skyscanner. You can fly into Guatemala City, which is located about 24 miles from Antigua. How will you get to Lake Atitlan? A private shuttle from Guatemala City to Antigua takes about 1.5 hours and should cost about $40 and can be arranged by your hotel or online. Shared shuttles leave from Guatemala City to Antigua several times a day. The trip should take about 1.5 hours and should cost about $15/person. There are several operators and reservations can be arranged by your hotel or online. As mentioned earlier, the entirety of Antigua stretches over a very flat 10 square blocks. The city is very clean and the streets are lined with shops and boutiques. Add a very comfortable mountain climate and there really is no other way to get around in Antigua than walk. With prices ranging from $35-$145/night, from budget to luxury, you’re sure to find the right hotel in Tulum. We’ve found some great hotel deals using Priceline’s sister site, Agoda.com. With 38 hostels in Antigua, you’re sure to find a hostel that fits your need, although it’s always wise to book ahead. Prices range between $8.50-$72/night, depending on your choice of private or ensuite room. Hostelworld always has great deals, especially in Antigua. We love using Airbnb. From private rooms to entire homes, Airbnb is represented in all parts of Antigua and the average Airbnb price is only $76/night. If you’re a first timer to Airbnb, use our coupon for $35 off your first night’s stay. Guatemala’s national currency is the Quetzal and is currently exchanging at 7.86Q for $1USD. Credit cards are widely accepted and ATM machines are readily available. Note that USD is sometimes excepted at Antigua, but expect less than satisfactory exchange rates. Traveling through Antigua is exciting and safe, but you never know when some good travel insurance could come in handy. World Nomads offers the best coverage in the business, is affordable, and is quick to act should something go wrong. For more info, check out our recent World Nomads blog post. If planning on visiting Antigua, you might want to check out our Antigua resource page.